The urge to rescue is sometimes irresistibly strong. It was a bright December day, early. Winston and I walked to the end of Ogden Road, where it joins the parkway at a right angle, as do many of the side streets in the neighborhood. Across the two lanes, which were busy with morning rush-hour traffic, I saw a big dog, black, pushing its nose into leaves in the ribbon of soft grass and dirt between the sidewalk and road. The dog was so deliberate and calm, staying in place, that it took me a few moments to realize it was alone. No leash, no owner. I stood where I was, and I looked up the parkway and down. Winston seemed to look in unison with me, but really it was the motion of the passing cars that fascinated him. I don’t know if he really looks. “No, Jane,” I said to myself inside of my head. “You don’t have to save this dog. Keep going.” I am aware of my desire to help even when it is pathological. I can resist, I thought. “Well, what’s a reasonable thing I can do?” More internal dialog. I thought of calling Grace, at home in bed. “Bring me an extra leash,” I would say to her. “We have to save a dog today.” She’s like me and would get excited by such a mission. Still, I didn’t call. I mustered my self-restraint. 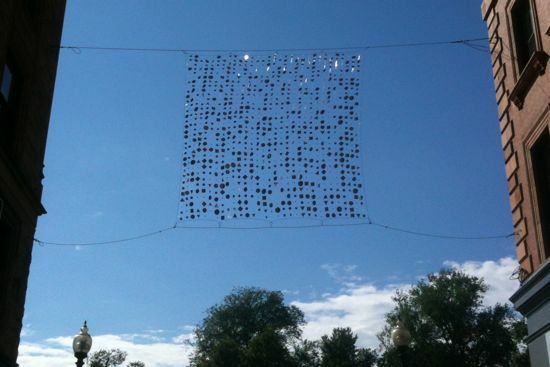 Down in front of the library, I saw a man looking up the parkway in our direction, shading his eyes. I started walking then trotting in his direction. “Sir! Sir!” I was waving my free arm. Winston on leash trotted beside me. A big man in a blue tshirt (no coat! ), with a full head of gray hair and black-rimmed glasses, he started walking toward me. We were the only people outside not in cars; we had to walk toward each other. 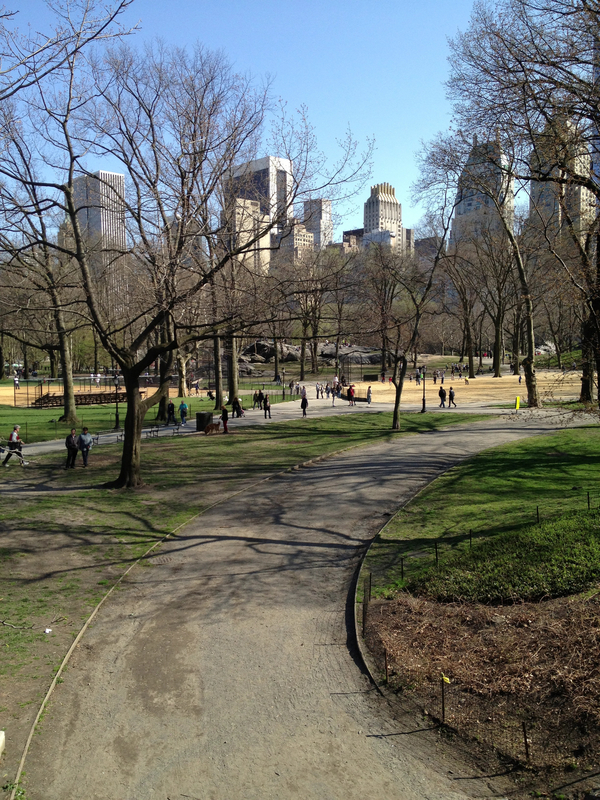 On Monday, April 15th in the afternoon, Lydia and I were walking through Central Park from the Guggenheim down to Columbus Circle. It was the end of a two-day trip to the city to see a college that Lydia is interested in applying to. There appear to have been explosions at the finish line of the marathon. We are at the arboretum, far away. I did not know enough to worry, and I ignored the text. Maybe “explosion” meant firecrackers launched by naughty kids. Lydia got a message from a friend about the explosions, and she followed up. Perhaps she is more easily alarmed than me, by personality or age. “Mom!” she said something like this, urgently, and conveyed the seriousness of what had happened. Our walk to Columbus Circle — to go to Whole Foods to get something to eat on the train before we headed to my sister Emily’s office and then Penn Station — lost its power. The beautiful spring day seemed to be happening to other people. 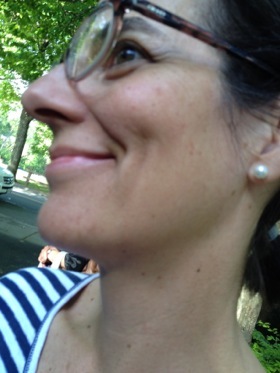 Lydia even remarked, as we passed New Yorkers, that they probably didn’t know yet. I did stop to take this photo (above) on a bridge that looked over a playing field and what is called Central Park Running Path, according to the geographic locator in Instagram. Lydia discouraged me from taking more, claiming that our moment for picture-taking was gone. I didn’t know what I felt: distracted, there-but-not-there, worried about our travel plans. When we got to my sister’s office near Penn Station, we heard more. We watched videos on our phones and my laptop. We discussed. The word “amputations,” more than any other detail, provoked whatever it is I felt, and those feelings I could not name. The birdhouse, which came with the big tree on our property when we bought it in 1999, has no function. There has never been a bird in it. Once I saw a squirrel in it and another time a full triangle of pizza! I put the two together and deduced that the squirrel had stolen it from garbage and set it aside for later eating. 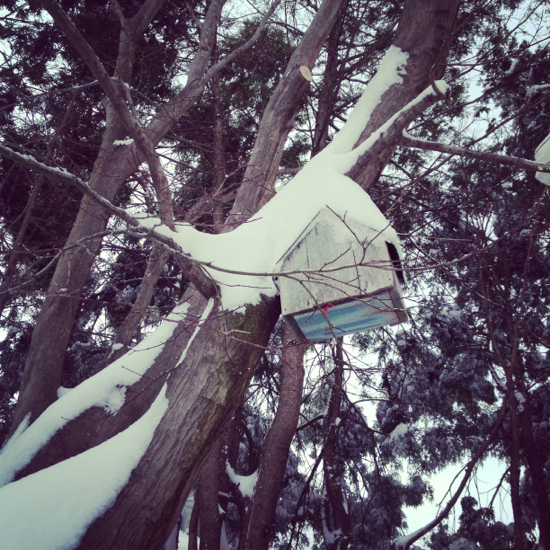 It seems banal to take a picture of a snowy birdhouse among snowy branches, but often the everyday items of our lives gain in resonance and beauty when they stand out, visually emphasized by the snow, which obliterates the background. So much was blanked out in this Blizzard of ’13. Even my neighbors’ yard, which abuts ours, became softer and more lovely to look at in the snow. The dying cypress hedge punctuates the view, indicates where we end and they begin. Last summer, the dying cypress hedge, dried and brittle looking, was only an eyesore and the topic of repetitive unresolved conversations with the neighbors, who own the hedge and don’t want to cut the shrubs down. Isaac and Olga want to leave the hedge there and plant other things in front. Bamboo, for example. In the meantime, to get privacy from us, they have leaned old wooden pallets against the dying hedge and planted junk vines that they have draped on the dying branches. On our side, I have done no more than keep it clean and trimmed. A fence is called for, but expensive. I imagine standing in their yard and looking past the dried, thinning cypress into my yard: big Japanese maple, recently painted house, no debris in yard. I feel proud — too proud — and resentful. Why do they get my work as a view and I have to look at their clutter as mine? At one time, when the children were small and we had a swing set and less time for gardening, no doubt there were days of our clutter that they had to look at. Maybe they are more generous, or more clutter-loving, and could look past what was then our stuff and appreciate the activity. When we meet them in the summer at the property line, they do comment on the children and reminisce about the times they watched them play. “What a nice family,” they say. We have been spied on kindly, I gather. It’s not them I don’t like. In fact, on days when they set up all their white tables and borrowed chairs, I know their many friends are coming and that the yard will be filled with people visiting, talking, eating, and that the lovely sound of a chorus of voices in the outdoors dark will comfort me as I go to bed. It’s like the sound of being a child and going to bed while one’s parents and their friends are in the living room or finished basement, playing cards and drinking cocktails and laughing. The sound of both mystery and safety. Chores to do. Walk to take. We took a break from one and went on the other. Jimmy was enthusiastic, but I had to promise the reluctant Grace that when we hit 20 minutes we’d think about turning around. Heading to Allandale Farm, we cut through the beautiful Walnut Hills Cemetery. There are enough paths and gentle hills to make it a decent walk, which we’ve done many times. I thought I had seen all the gravestones of interest. Today this knee-high marker caught my eye for the first time; the small pumpkin at its foot was a beacon. Infants died for many reasons in 1924, as Elsa Woodbury did at only one day old. 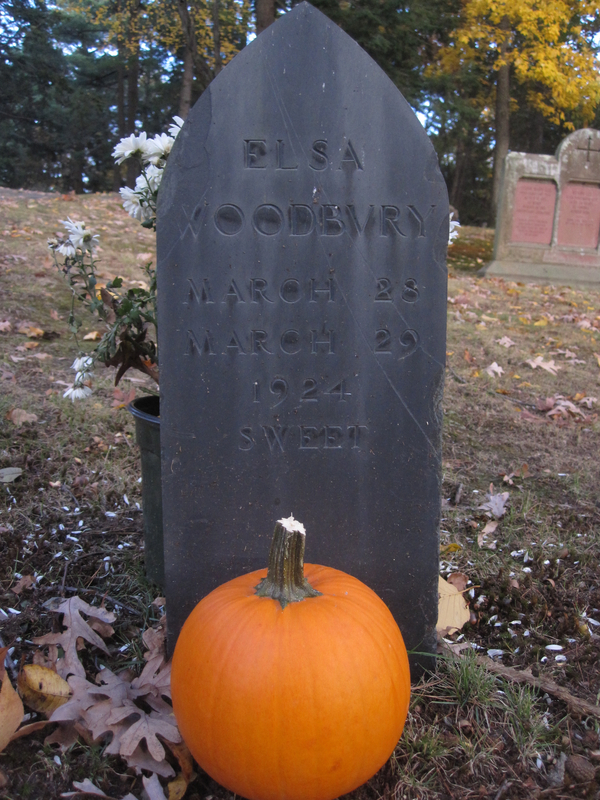 The mystery is who is bringing a pumpkin to her grave 88 years after her death. No doubt her parents are dead. Grace speculated that a living, younger sibling could have done it. I wondered about a niece or nephew. Somehow, though, the memory of sweet little Elsa remained powerful enough in a family’s collective mythology that she would get a pumpkin for Halloween, the only one we noticed, by the way, in the cemetery today. Does anyone else have a story idea for this find? Photograph by Grace Guterman, at my request. 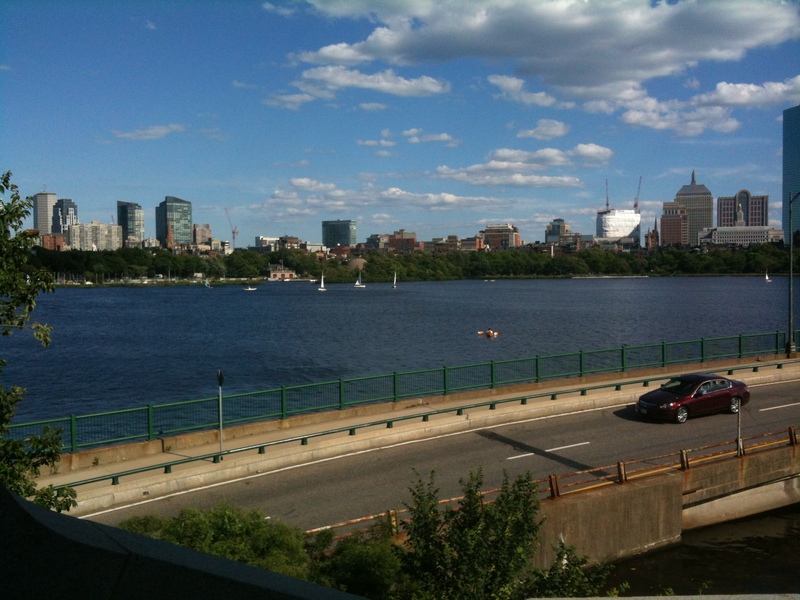 I took the same route back to my parked car today as I did last Monday afternoon: through the Common, down Charles Street, and across the Longfellow Bridge back to Kendall Square from Park Street. This time, I took my own photo. I met no strangers on the bridge, but I did walk by many of them. One smiled. On my walk, I thought for almost the whole time about the power of the words, “I’m sorry.” My shift on the GLAD Legal InfoLine was busy today. Lots of calls. So many of the calls I get have to do with gay marriage or immigration issues. Once in a while there is one that has to do with crime, and the caller as victim of one. Today there were two. To one fellow, after he had told me a long yet coherent story about being beaten, I said, “I’m so sorry that happened to you. It sounds very upsetting.” Until that moment, his voice had been measured and regular, sort of like the tone of voice a friend would use as you sat together at a coffee shop and discussed an incident that had happened to a third friend. His voice broke. “It was.” That was all he said. I could hear the loosening inside him. I felt loosened myself, not crying but as though I could. I got practical again and made some suggestions. He rallied. I’d like to think we both felt as though we were moving forward in solving a problem and that it seemed, for the moment, better. Let’s no longer talk of the things we want to do. Let’s do them. A four-piece brass band was playing at the mouth of Winter Street. The guys were older and paunched, all wearing yellow vests, and they enthusiastically tootled “Under the Sea” from The Little Mermaid. It was wonderfully done. I looked, but there was no cup on the sidewalk collecting change. One song, and they left. If you want to make music, make it. On Mondays, I usually go to the Starbucks on Winter and get a cup of coffee and the fruit-and-cheese bistro box for lunch before heading up to GLAD. Walking there, I saw a man with a beautiful, muscled body walking up the middle of the street from downtown. Otherwise bare, he wore only tan shorts and flip flops, and as we neared each other I could see that his face had been burned and later treated with skin grafts — it was like melted wax, smoothed and cooled, but the eyes dark and liquid and still piercingly human. 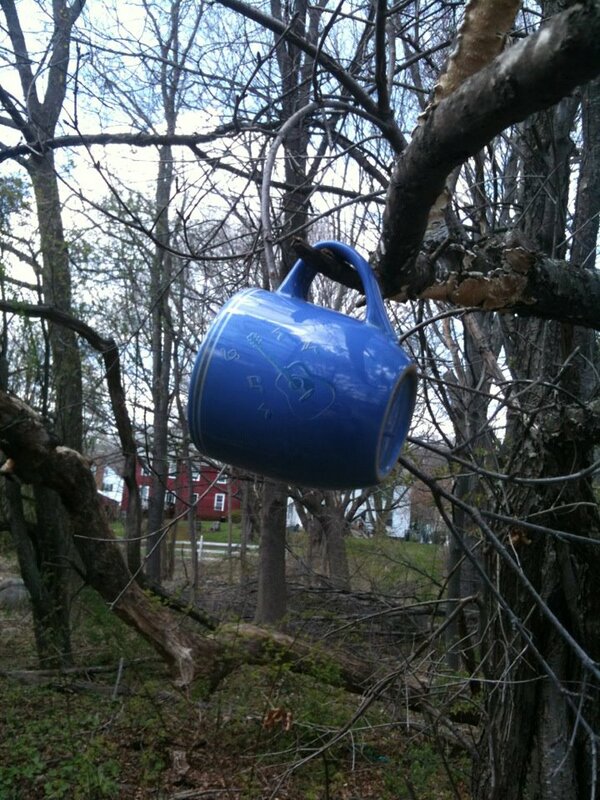 This magical place exists not too far away, in Milton, MA, where my sister Sally lives and where she spotted this perfect blue cup hanging from a tree. Sally sent a picture my way. The next day, walking the same route, the cup was still there. Later it disappeared. There is a place in my brain activated by the word “coffee,” by the implements of coffee, and by the thing itself. If you’re my friend and you like coffee (James or Marcia, for example), then I like you extra. Siblings, you too. Every coffee story or image reminds me of another one. Recently in one of my early classes, I got to the lab right on time, 9 a.m. It’s a big enough class that several other instructors are involved, and one of them is in the habit of stopping at Dunkin Donuts on the way in and buying munchkins to share and a coffee for himself. On this particular morning, I hadn’t had time to get my own coffee, and I felt forlorn, although I did fake a good coffee alertness face. And yet my eyes kept tracking the movement of Phil’s giant iced coffee around the room. I was like a dog who perks up when people food is about to be served: ears pointed, nose twitching, eyes wide. The coffee-bearer offered the box of doughnut holes around, one instructor at a time. He reached me. “Do you want one?” he asked. “Actually, I’ve been eying your coffee,” I admitted, perhaps panting a little. “Oh, by all means have some!” he said enthusiastically. I got a cup from near the wash-up sink. I held it out to him; he took the top off his plastic cup and poured. I was happy — it had not been hard to get what I wanted. I drank. An hour passed as student teams worked on their projects, and instructors hovered around helping and prompting. I kept my eye on Phil’s iced coffee and noticed that half remained, with ice still bobbing in it. Want more? he signaled by pointing at the cup. I nodded. He walked over and refilled my cup. “You’re like my dealer,” I said and smiled. He laughed. Image by Sally Kokernak Millwood, found April 10, 2012 in Milton, MA. Thanks, sis! Recent travels in the neighborhood, either on foot or in car, have taken me past Allandale Farm, still closed for the winter. Curiously, there are two bulls regularly lounging in the shade near the algae-filled pond. I say curiously because this is a new sight at the farm, and I have no idea why they are there. “My guess is that the farm has rented them to sire the cows,” I say. Then I recall that there are no cows there. “I don’t really get it,” says Grace. For once, I decide not to explain everything. Beyond mentioning that cows are female and bulls male, I avoid the topic of animal husbandry. But the desire to get up close and inspect the bulls remained. Today I walked over to the farm, cutting through the cemetery — yeah, I know, growth and death, circle of life — and made my way over to the pond. There is a shed and pen for the bulls, and as I approached, one of the bulls stuck his massive head over the wire fence. I was kind of flattered, as though the bull had pegged me as a friendly person who might give an apple or a pat. I was also intimidated: the bull was bigger than a VW Beetle, his head alone bigger than a 30 pound supermarket turkey. Turns out, he didn’t want me, an apple, or a pat. He wanted to scratch. First he rhythmically scratched behind his right ear by rubbing it on the chain link fence post. His eyes rolled back in the sockets. Next he rhythmically scratched behind his left ear after deliberately adjusting the position of his head. This I videoed. He was smart enough to get what he needed from his environment. I walked home in the other direction, through a neighborhood of once-starter homes that have been lived in for ages. I noticed that, in most of the yards, a number of idiosyncratic gardening purchases and decisions have mostly led to clutter, either actual or visual. I made a mental note to go through my own yard carrying a big plastic garbage bag and to throw out the old plastic pots I’ve left here and there as well as the ugly or surplus ornaments. The season for gardening is beginning. My last stop before home was the local Starbucks for iced coffee. Some itches are easy to scratch. I might as well this one, I thought. “So, like, they’re therapy bulls, er, steer?” I asked. “Yes, like that,” she answered.